The nation's security agencies have been ordered by President Umaru Musa yar'adua to take all necessary actions to subdue the irredentist Islamic sect, Boko Haram, which has been clashing with the police in many Northern states since Sunday. Adeniyi said the president gave the order after being briefed yesterday by the heads of the security agencies on the violent attacks in parts of Bauchi, Borno, Kano and Yobe states. He said “President Yar'adua directed that no effort should be spared in identifying, arresting and prosecuting leaders and members of the extremist sects involved in the attacks. According to the Adeniyi, President Yar'adua deeply regrets the unneccesary loss of lives occasioned by the wanton and unprovoked attacks on the police and other innocent Nigerians in the affected states. Meanwhile, the death toll has increased and killings spread as followers of the radical Boko Haram Islamic sect yesterday expanded their attacks against the security agencies to three more states in the North, leaving more than 100 persons including soldiers and policemen dead in clashes that first erupted in Bauchi on Sunday. Early morning gun battles between police and members of the sect, which is opposed to the western education and propagates a wholesale adoption of Islamic law across the country, were reported in Borno, Kano and Yobe States. Over 100 persons, most of them followers of the sect, were killed in Maiduguri, 3 persons were confirmed dead in Wudil, Kano State, and two others died in Potiskum, Yobe State in gun battles between security forces and the sect's followers. A number of police men and soldiers were also killed in the fighting. The attacks came a day after more than 50 people were killed in neighbouring Bauchi State, following at attack on a police station by the sect's followers in retaliation for the arrests of their leaders. In Maiduguri, the sect members appeared to have grouped themselves in batches and simultaneously attacked targets around the city at about 12.30am. They ambushed at the state police headquarters in Maiduguri, sparking off a shootout that lasted over three hours. Fifty of the sect followers were killed there and the others retreated. In the various battles, at least eight police officers, two soldiers and three prison officers were killed, the new prison in the city was broken and prisoners freed, while homes of policemen and police stations were also set ablaze, in an apparent fulfilment of the promises of retaliatory attacks made by the sect's leader Ustaz Muhammad Yusuf. One of our correspondents counted 101 bodies, 49 by the police headquarters and the others scattered around town. The police identified 90 of the bodies as those of killed members of the sect. The sect members killed a police sergeant by the gate of the police headquarters, burnt nine residences of mobile policemen at the Mobile Police Training College near the city and also killed four policemen undergoing promotional courses in the college. They also killed the second-in-command officer of a mobile police unit whose name was given as Superintendent Usman Farouk. Elsewhere in the city, another batch of the sect members overpowered men of Nigerian Prison Service, killed three of them and broke into the Maiduguri new prison and freed inmates. A team of the sect members also killed a policeman at the residence of the commandant of the mobile police training college. They also burnt Lamisula and Gamboru police stations in Maiduguri and vandalised properties. The sect members had a long exchange of fire with men of Operation Flush, a combined military and police anti-robbery team. Security sources told our correspondent that the sect members launched a similar attack in Damasak, headquarters of Mobbar local government area of the state and killed a policeman. All activities were brought to standstill in Maiduguri yesterday, as few vehicles moved around amidst intense stop-and-search mounted by the police and the military. Communications were disrupted as telecoms installations in Maiduguri were attacked. The Ibn Taimiyya mosque and residence of Ustaz Muhammad Yusuf, leader of the sect, was intact as at 4pm yesterday. Later yesterday, Governor Ali Sheriff declared a dusk-to-dawn curfew in all parts of Maiduguri and Jere, a neighbouring local government area. The governor's Director of Press Usman Chiroma said in a statement that the curfew was from 7pm to 6am and will continue until security situation improves. In Kano State, 44 kilometres from the state capital, more than 50 of the sect members attacked the Wudil town Police Station around 3am yesterday, wounding the Divisional Police Officer (DPO) and another policeman on duty. The attackers seized two AK 47 rifles, with which they injured the DPO Sagir Idris and one other mobile policeman, Kano Police Public Relations Officer SP Baba Muhammad said. He said 50 suspects including a 14-year-old were arrested. The teenager, Aisha Abbas, told our correspondent that her uncle conscripted her into the radical group. “My uncle Ayuba only asked me to follow him, and so I did. We met the remaining members and went off. I didn't even know where were going to,” she said. Although the leader of the group, who identified himself as Abdulmumini Ibrahim Muhammad, told our correspondent that they were not the ones who attacked the police, he said he was proponent of the Boko Haram ideology. He said why they were opposed to western education and science is because they contradicted the verses of the Holy Qur'an and Sunnah, the traditions and teachings of the Holy Prophet. In Wudil town where the clash happened, there was uneasy calm as police deployed mobile police to prevent possible attack and ensure law and order in the town. Chairman of Wudil Local Government Alhaji Musa Adamu Darki said normalcy had returned to the town. In Yobe State, armed youths stormed Potiskum and razed down many government buildings, including the divisional police headquarters, where they killed a police officer Usman Shehu and another civilian who was burnt to ashes. Governor Ibrahim Gaidam responded by imposing a curfew from 10pm to 6am in all the 17 local government areas of the state. The suspected fanatics, numbering about 50, said to be on reprisal attack, used sharp knives and inflicted serious injuries on the necks and body parts of seven other police officers on duty at the police station. They freed all the suspects in custody at the station and set it ablaze before fleeing. The injured policemen were taken to Potiskum General Hospital, where they were receiving treatments. None of them could speak to journalists due to the severity of their injuries. 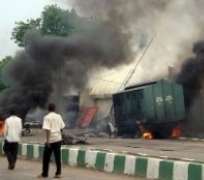 Eye witnesses said the attackers who arrived on many motorcycles during a heavy downpour around 2am yesterday set ablaze parts of the offices of the Federal Road Safety Commission (FRSC) in the town and the office of the National Population Commission (NPC) among other buildings. Chanting “Allahu Akbar” in a thunderous voice, witnesses said, the attackers took away all the guns and ammunitions at the police station. Potiskum town was thrown into pandemonium as residents, who were mostly asleep when the attack began, woke up in confusion as thick smoke enveloped the skies. Many women and children ran to the palace of the Emir of Fika Alhaji Muhammadu Abali Ibn Muhammadu Idrissa where they sought refuge. Yobe State Commissioner of Police Mohammed Abbas Murtala, who was at Potiskum to assess the extent of the damage, told reporters that 23 suspects had so far been arrested. Police Area Commander in Potiskum ACP M.A. Mustapha said that police had recovered some items believed to be owned by the suspects including head tie, books with some phone numbers written on them. “Our investigations revealed that most of them are indigenes of the town and when we visited their houses, their wives confirmed that they did not pass the night at home,” he said. Some residents attributed the incident to the “laxity of the police” in the state for “failing to be alert and beef up security despite tension in many parts of the northeast including Maiduguri and Bauchi,” as Baba Yaro, a resident of Potiskum, said. He noted that the attackers took advantage of the heavy rainfall to carry out their act. The Boko Haram sect is being referred to in some quarters as the Nigerian Taliban, and it first emerged in 2004 when it set up a base in Kanamma village in Yobe State, on the border with Niger, from where it attacked police outposts and killed police officers. Its membership is mainly drawn from university dropouts.